The Yahoo Hammock Chair by Sheltowee is a mini hammock designed for sitting and lounging and holding gear (among other uses). It uses a hex patterned ripstop nylon material, gathered at the ends with either a continuous loop or a standard cinch buckle. The hammock comes in a silnylon stuff sack. The end caps create a nice, finished look. The Yahoo hammock chair packed (far right) can compress even further. 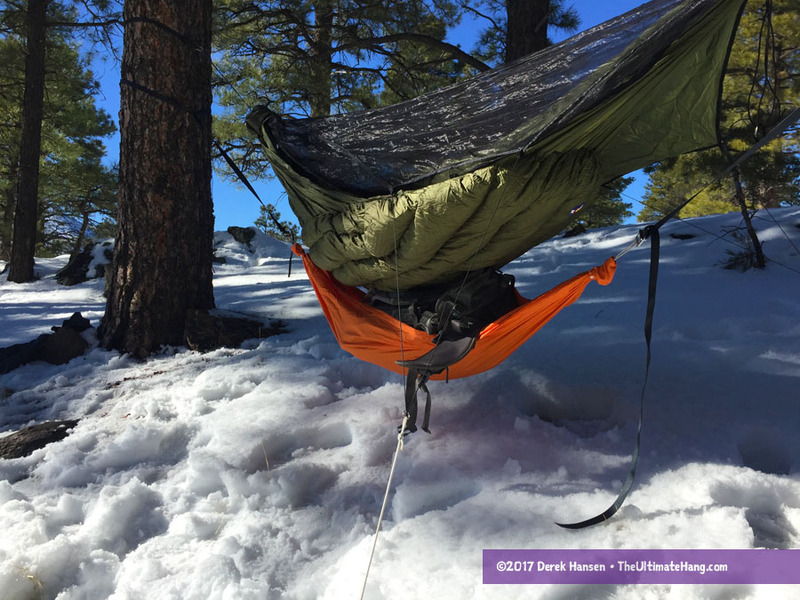 A gear hammock creates a nice storage area, keeping your gear off the ground and easily accessible. 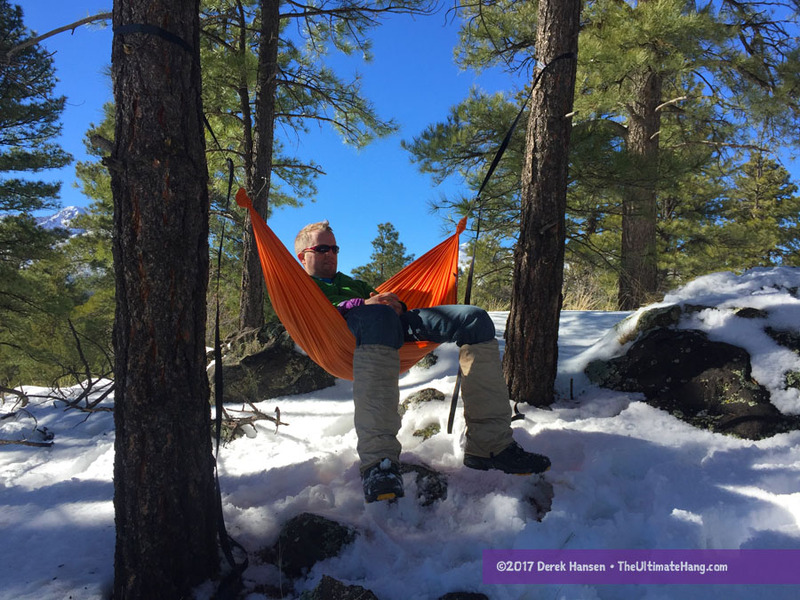 Miniature hammock chairs are some of the most versatile gear items. 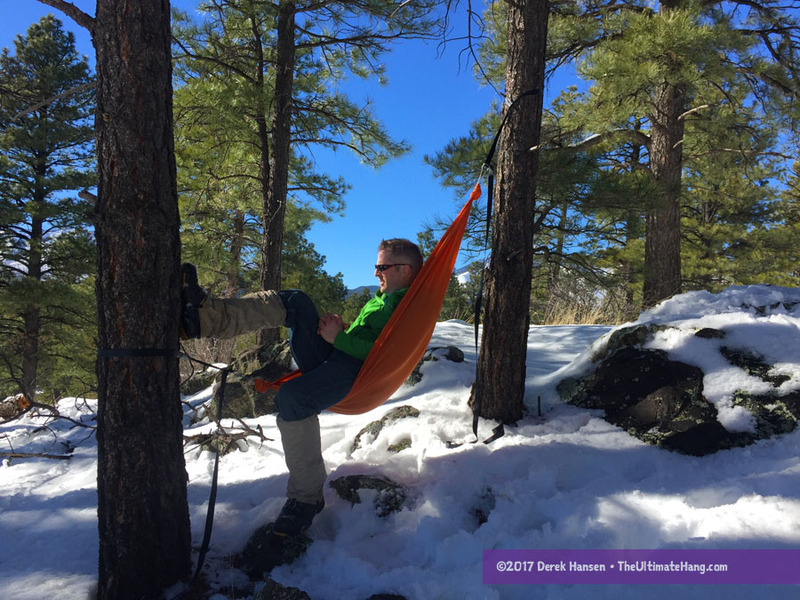 The Sheltowee Yahoo Hammock Chair has a very simple design and uses an easy-to-use cinch buckle suspension system. The hammock itself is very lightweight and packs down to the size of a softball. The cinch buckles have been wrapped to prevent twisting, and the end caps have a nice finished wrap, giving a professional look. The hammock has very high-quality construction with tight, even stitching and professional hang tags. It’s the kind of quality I’ve come to expect from cottage vendors and Sheltowee in particular. The cinch buckles, while handy, nearly double the weight of the kit. If you have your own suspension system, you can order the Yahoo with continuous loops instead of the buckles, saving weight and bulk. Suspension and Anchor System ♥ ♥ ♥ ♥ ♥ The single strap doubles as adjustable suspension and tree protection in one. The cinch buckle is fairly easy to use, but care must be given that the strap is fed without any twists and is flat and flush so it doesn’t slip. Construction and Craftsmanship ♥ ♥ ♥ ♥ ♥ High-quality construction and materials used. The end caps are a nice touch. Modularity ♥ ♥ ♥ ♥ ♥ With so many uses, a gear hammock makes for a very versatile and modular item. Aesthetics ♥ ♥ ♥ ♥ ♥ Available in multiple color options. Price and Value ♥ ♥ ♥ ♥ ♥ Great price for both hammock and suspension. A detached silnylon stuff sack. OK, great idea, but why pay 40 bucks for a piece of nylon with a knot at each end? Easily diy. Sure, but not just everyone has the skills or time.